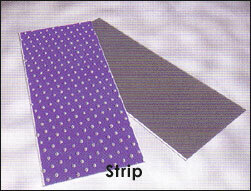 Same as PG…F series, but with different composition of sliding layer (GLYCODUR® A). Suitable for: Bearing applications similar to GLYCODUR® F, where, in addition, there is a risk of misalignment, edge loads and increased contamination, and for bearings with linear movement. 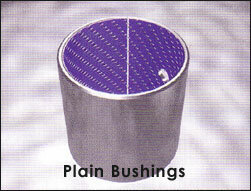 Top layer is thicker than with GLYCODUR® A bearings. Similar to GLYCODUR® A, but where misalignments will have to be avoided or where small-bearing clearances must be obtained by subsequent machining of the bearing bore. Cylindrical dry sliding bearings made of a three-layer compound material (GLYCODUR® F) in metric sizes, with lateral thrust flange. Suitable for: Radially loaded bearings and bearings loaded in one axial direction only, same as PG…F series. 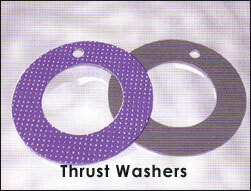 Thrust washers made of a three-layer compound material (GLYCODUR® F) in metric dimensions. Suitable for: Space-saving bearings, axially guiding bearings with maintenance-free operation. Same as PXG…F series, but different composition of the sliding layer (GLYCODUR® A). Suitable for: Bearing applications similar to GLYCODUR® F, with an additional risk of angular deviation or increased contamination. Strip material made of a three-layer compound (GLYCODUR® F) in metric sizes, adaptable to individual requirements by bending, pressing, cutting etc.. Suitable for: Space-saving dry sliding guides of any kind. Same as PLG…F series, but different composition of the sliding layer (GLYCODUR® A). Suitable for: Sliding guides as with GLYCODUR® F, where subsequent machining is required, or where the risk of increased contamination exists. GLYCODUR® dry sliding bearings are available in two standard versions, as GLYCODUR® F and as GLYCODUR® A. Both versions have different sliding layers. GLYCODUR F® sliding bearings have a copper-plated steel base, to which a 0.2 to 0.4 mm porous tin bronze layer is sintered on. The pores of this layer are filled during one rolling process with polytetrafluoroethylene (PTFE) mixed with friction reducing additives. A 5 to 30 um top layer made of the same material forms the running-in layer. GLYCODUR® F sliding bearings represent an optimal combination of the mechanical properties of the sintered bronze with the sliding and lubrication properties of a PTFE mixture. The structure of the composite material results in good dimensional stability and good thermal conductivity. 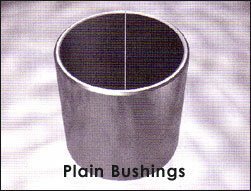 GLYCODUR® A dry sliding bearings also have a copper-plated steel base and a 0.2 to 0.4 mm sintered tin bronze layer. The principle characteristic of these bearings is the polyoxymethylene (POM) top layer solidly joined to the sintered bronze. This surface layer is relatively thick, 0.3 mm, featuring pockets for lubrication grease. 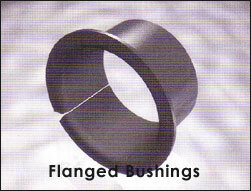 GLYCODUR® A sliding bearings are therefore to some extent unaffected by misalignments including related edge loads.